"Markneukirchen Violins and Bows from Saxon and Bohemian Musikwinkel Late 19th and early 20th Century"
Bruce Babbitt received his BFA from the Honors College at Kent State University specializing in painting and sculpture. He received his MA from the Royal College of Art in sculpture. His first interest in violin identification, buying, and selling of instruments, started in London in 1973. Bruce has worked at these endeavors for over 40 years. His interest has been a broad one, specializing in the general market of violins and bows. Bruce is also an avid collector of certain instruments & bows that he thinks are exceptional examples of their type. He has plans in the works to author a second book in order to share this collection. Bruce coordinated his efforts with the VSA to present the exhibition on The History of Violin Making in Ohio at the 38th Convention in 2010. He then organized, also for the VSA for their 2012 Convention, the highly successful Study Exhibit titled Musikwinkel Around Markneukirchen which became the basis for this book. ​Thank you for visiting. If you have questions please email us by clicking the button below. We will return your message as soon as possible. 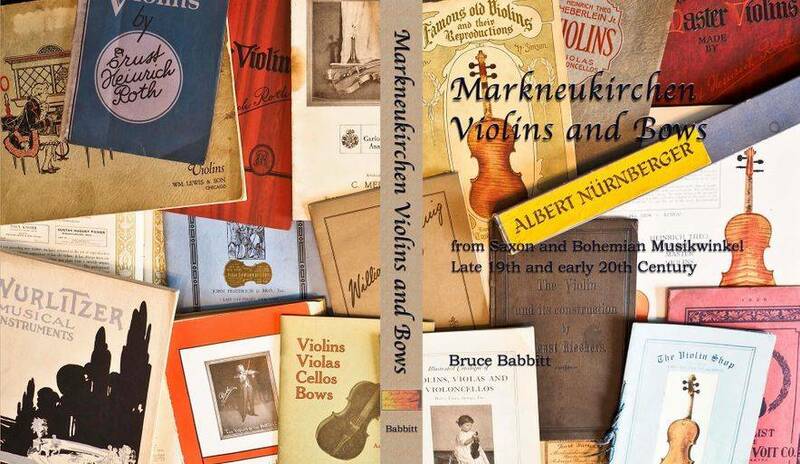 Click to order the book "Wanderer/Wonderer"
Copyright 2014 Bruce Babbitt, "Markneukirchen Violins and Bows"